New research details how tiny imbalances in the phytoplankton predator-prey relationship, caused by environmental variability, give rise to massive phytoplankton blooms, having huge impacts on ocean productivity, fisheries and carbon cycling. 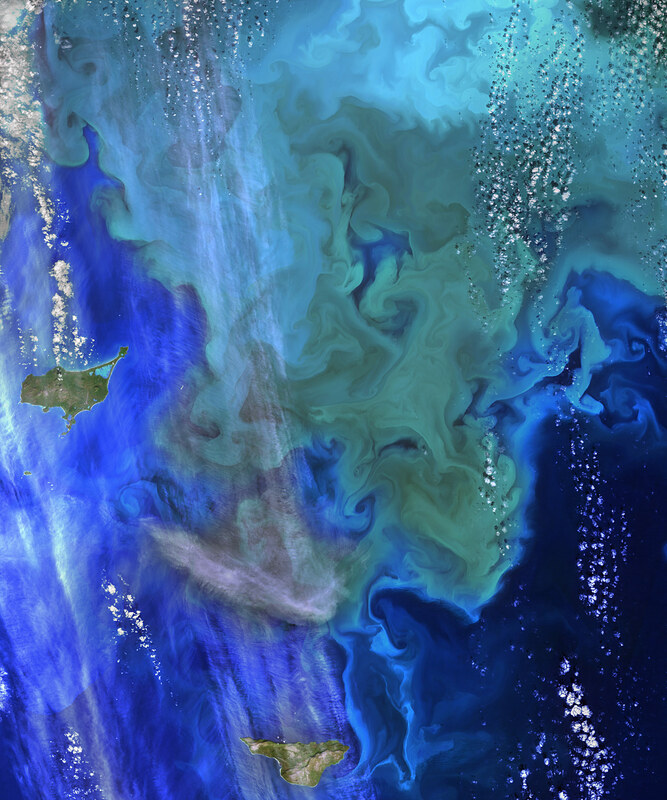 The greens and blues of the ocean color from NASA satellite data have provided new insights into how climate and ecosystem processes affect the growth cycles of phytoplankton—microscopic aquatic plants important for fish populations and Earth’s carbon cycle. At the bottom of the ocean’s food chain, phytoplankton account for roughly half of the net photosynthesis on Earth. Their photosynthesis consumes carbon dioxide and plays a key role in transferring carbon from the atmosphere to the ocean. Unlike the plant ecosystems on land, the amount of phytoplankton in the ocean is always followed closely by the abundance of organisms that eat phytoplankton, creating a perpetual dance between predators and prey. This new analysis shows how tiny imbalances in this predator-prey relationship, caused by environmental variability, give rise to massive phytoplankton blooms, having huge impacts on ocean productivity, fisheries and carbon cycling. The study was released Thursday, September 25, in the journal Nature Climate Change. Behrenfeld calls this close predator-prey relationship the “Dance of the Plankton.” This view is different from previous perspectives that have simply focused on environmental resources used by phytoplankton to grow, such as nutrients and light. The new view is important because it reveals that tiny imbalances can greatly impact Earth’s ecology. Over the past few years, Behrenfeld has collaborated with Emmanuel Boss at the University of Maine, Orono; David Siegel at the University of California, Santa Barbara; and Scott Doney at Woods Hole Oceanographic Institute, Woods Hole, Massachusetts, to develop a new theoretical framework for explaining phytoplankton blooms, which they call the “Disturbance-Recovery Hypothesis.” According to this view, blooms can be started by any process that disturbs the natural balance between phytoplankton and their predators. A disturbance may involve deep mixing of the surface ocean by storms, bringing up deep ocean water along coasts (known as coastal upwelling), a river flowing into the ocean or even an intentional disturbance such as fertilizing ocean ecosystems with iron. The new study is focused on the second part of the hypothesis – how plankton ecosystems recover once they have been disturbed. Behrenfeld explained that in ocean ecosystems, the activities of the phytoplankton are closely followed by the organisms that consume phytoplankton, in a sense, similar to two balls connected by a rubber band. If one ball is hit with a paddle, it will accelerate ahead of the other ball. Once the lead ball starts to slow down, the other ball will catch it, even if the lead ball is still moving forward. Using data from NASA’s Moderate Resolution Imaging Spectrometer (MODIS), Behrenfeld shows how tight predator-prey relationships are a common feature of plankton ecosystems across the global ocean. Even in regions where phytoplankton blooms do occur, they result from only minor imbalances in this relationship. By focusing on the North Atlantic Ocean, where one of the largest phytoplankton blooms happens each year, the study shows how deeper winter mixing gives rise to larger phytoplankton stocks. This finding is important because it suggests that ocean warming over the coming century, which will decrease winter mixing, may significantly decrease peak phytoplankton stocks. Behrenfeld also tracked the annual cycles of phytoplankton over a 10-year period in the North Atlantic using data from NASA’s Sea-viewing Wide Field-of-view Sensor (SeaWiFS). He showed for the first time how changes in phytoplankton populations over time are governed by periods of accelerating and decelerating division rates. This discovery finally connects the start of a phytoplankton bloom to its final climax, which may occur many months later. The next steps are to understand how species succession impacts bloom development and to learn how the carbon dioxide taken up by phytoplankton is processed within plankton ecosystems and then transferred and stored in the deep ocean. These advances are critical for understanding how changes in phytoplankton blooms translate to impacts on fisheries and climate. These challenging goals will require a greater integration of satellite, modeling and field studies. “Current satellites, such as Terra and Aqua, monitor changes in phytoplankton abundance that continuously occur across the globe,” said Behrenfeld. These changes reflect complex biological and physical interactions within ocean ecosystems. Understanding how these interactions function in today’s ocean is essential to predicting how marine ecosystems will change in the future.” Future missions, such as the Pre-Aerosol, Clouds, and ocean Ecosystem (PACE) mission, will further elucidate the plankton dynamics and responses to climatic shifts in the ocean. Be the first to comment on "How Tiny Imbalances Result in Massive Phytoplankton Blooms"